At Steve Swyka Auto Specialists we service and repair all makes and models of vehicles with unparalleled knowledge and excellence in service. Our focus is on customer satisfaction, with great attention to detail. 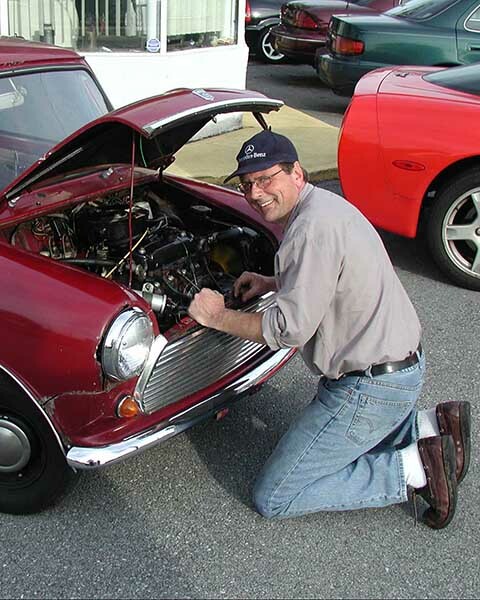 Servicing and repairing all makes and models for over 30 years - Steve started his first business in 1977 after attending the University of Delaware for pre-medicine. His first shop was located on 896 in Newark Delaware. He began his career at Iron Hill Mobile because of his natural ability and years of fixing and maintaining farm equipment and automobiles at his family farm in Middletown, Delaware. After a couple of years he then moved to work in the industry in various independent garages and dealerships in the area, with dealership experience in such vehicles as Oldsmobile, Volvo, Saab, Fiat, Peugeot, Chevrolet, Pontiac, Honda, BMW, Porsche, and Mercedes, and experience in independent garages like Andreas' Auto Repair, and Foreign Car Specialty, eventually becoming a Certified Master Automobile Technician. In 1985 the first Steve Swyka Auto Specialists opened in Wilmington, Delaware. More than 30 years and two locations later Steve operates his business at the crossroads of Foulk and Murphy Roads in North Wilmington, where he services and repairs all makes and models of vehicles with unparalleled knowledge and excellence in service. Please use this form to tell us about your vehicle and service needs. Once submited, one of our service technicians will contact you about scheduling. Thank you for contacting us for your car care needs. We'll get right back to you.… Say hello on Facebook.